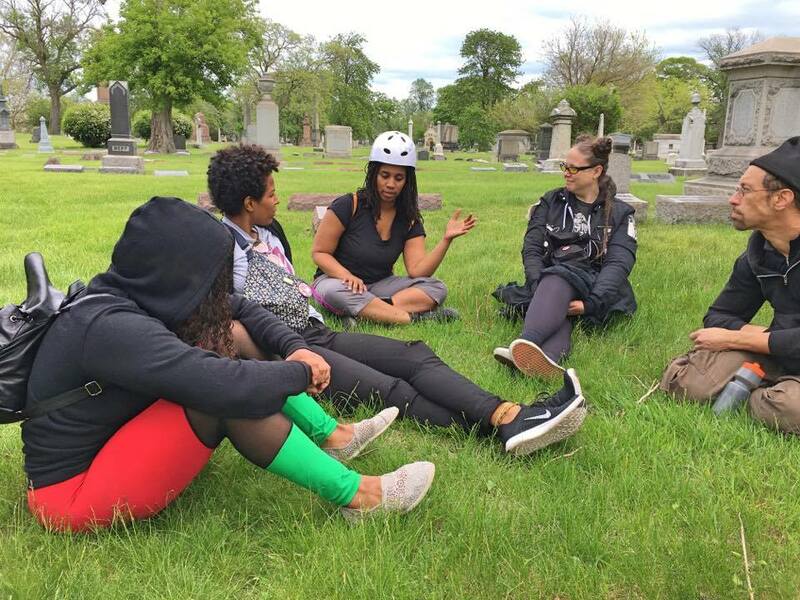 Last Sunday I set out with a group of enthusiastic cyclists of color on a mission to ride our bicycles six miles from Chicago’s Back of the Yards community to the burial site of Ida B. Wells at Oak Woods Cemetery in the Greater Grand Crossing neighborhood. Organized by members of the #LetUsBreathe Collective and myself, our intent was to ride out to reclaim a past and history that has rarely been taught accurately and to honor the life and contributions of Wells, a legendary anti-lynching activist, suffragist, and NAACP co-founder. We chose bicycles as our means of transportation because for marginalized groups, cycling has historically been a political act. In the 1890s, the bicycle was used a means for the emancipation of women during the first wave of feminism. Riding a bicycle allowed women to escape the constraints of domestic life, thus allowing them the freedom and mobility to organize for equal rights. For Black people cycling can also be a means of liberation. It can be used as a tool to improve health and fitness, save money, and work to reduce the air pollution that disproportionately impacts Black people. We started our ride from Breathing Room, #LetUsBreathe’s newly rehabbed arts, healing, and organizing hub in Back of the Yards. Starting from 51st and Loomis, six of us comrades pedaled south towards the Englewood community and then headed east on 57th Street. About five minutes into the ride, we began to notice all of the empty grass-filled lots that seemed to stretch on for miles. It almost seemed like we could’ve been rolling past plowed cornfields on the highway if it weren’t for the traffic lights along the route. Jamal Julien, a seasoned rider and cofounder of Slow Roll Chicago, noticed the confusion on my face and proceeded to give me a brief history lesson on the evolution of the Englewood neighborhood. Most of the early settlers of Englewood in the late 1800s were German and Irish immigrants, followed by Poles and other Eastern European newcomers at the turn of the century. After Chicago’s African-American population began growing during the early 20th Century with the Great Migration, and Black residents were displaced from other parts of the city by urban renewal demolitions in the 1950s, African Americans made up an increasingly large portion of Englewood residents. The black population grew from just 2 percent in 1940, to 69 percent in 1960, and 96 percent by 1970. Julien noted that white flight, redlining, and disinvestment during this period forced Englewood into a long economic decline. Many of the large retailers left the neighborhood taking jobs and money with them and many houses were abandoned and burned down, which contributed to the empty lots that we see today in the neighborhood and in other parts of the South Side. I thanked Julien for the history lesson and told him I would definitely be showing up for the next Slow Roll ride. As we exited Englewood and rode down Marquette and Cottage Grove into the Greater Grand Crossing neighborhood, the vacant lots became less prevalent, the buildings began to pop back up, and we saw neighbors sitting out on their porches enjoying the relaxed Sunday afternoon, and they waved a greeting to us. 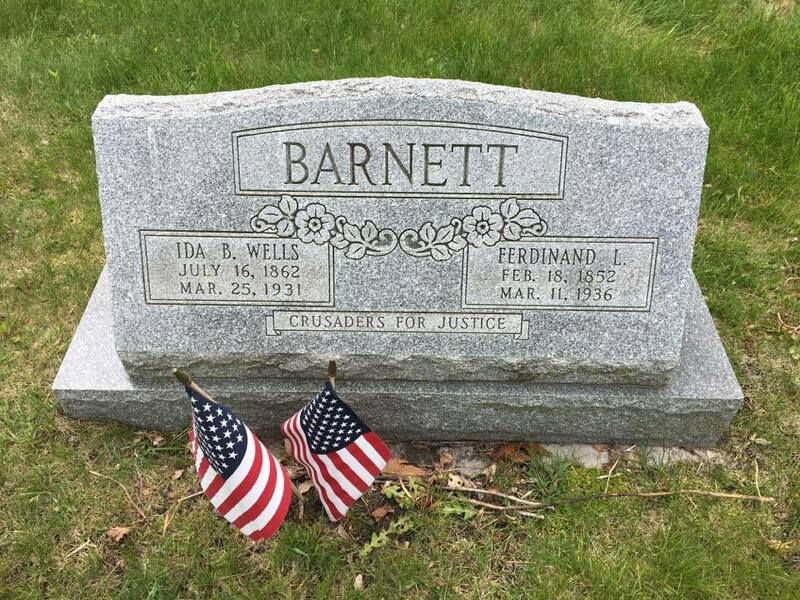 We soon rolled into the cemetery, where we met up with four other comrades, and then proceeded to look for Ida B. Wells’ headstone. It took us about 15 minutes to locate it, mostly because it was a very small headstone situated very inconspicuously among all the other monuments. After everyone arrived at the stone, we intuitively all sat down next to her grave and observed a few moments of silence. Afterwards was had a discussion Wells’ contributions to social change, which led to an understanding that history tends to repeat itself. For every step forward in civil rights for Black people, new forms of racial oppression have emerged. Plantation enslavement was replaced by lynchings and Jim Crow laws. Today, those lynchings and Jim Crow have been replaced with police murders of African Americans and what writer Michelle Alexander called “The New Jim Crow,” the prison industrial complex system. Wells dedicated a portion of her life to debunking the myth of the predatory black male, which justified the killing of thousands of black men in the late 1800s and 1900s. She documented and reported on hundreds of lynchings in the South, proving they were fueled by racial prejudice. Similarly, today we are experiencing modern day lynchings of black men and women at the hands of police officers. These lynchings are also being documented and investigated by social justice crusaders and journalists. It’s clear that the journey towards Black liberation isn’t over — there’s much more work to be done. We can’t identify or reach our destination until we know our history and where we are coming from, and we’re definitely gonna need bicycles on our journey towards freedom. Please join us later this summer on our next Black Power Bike Ride to Emmett Till’s burial site, in Burr Oak Cemetery in Alsip, Illinois. For more information and future events, please check out the #LetUsBreathe Collective on Facebook. Emmett Till’s grave is in Burr Oak Cemetery in Alsip. You might seriously consider also getting helmets, especially if you’re pedaling in an urban environment. yeah that’s definitely the point of this really inspiring and wonderful article. you sound cool! Folks, let’s keep the discussion civil. Thanks. Yep…the reader comments underline my point. Black lives on bikes matter, including those who came together this past Monday to ride and celebrate Juneteenth Day. Help show support for restriping faded bike lanes, and building new ones, in the Northwest Side community.